If you’re looking for a perfect dish to serve for your Cinco de Mayo celebration, look no further. 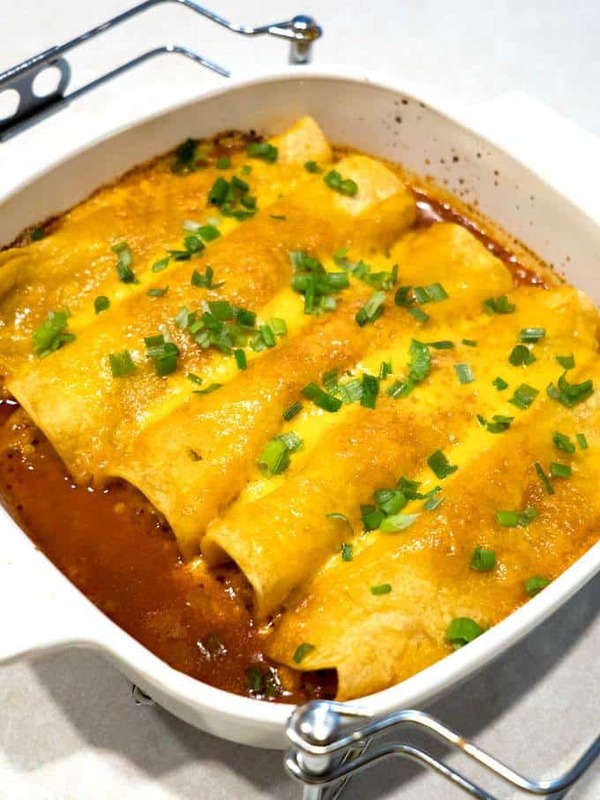 Chicken Enchiladas with Red Chili Sauce is easy to make, and absolutely delicious to eat! As a grand finale to Cinco de Mayo, I made these incredible Chicken Enchiladas with Red Chili Sauce. This was inspired by a recipe from America’s Test Kitchen, and goes perfectly with the Mexican Rice and the Smashed Black Beans. I used the following ingredients: Vegetable oil, onion, garlic, chili powder, ground coriander, ground cumin, salt, granulated sugar, boneless and skinless chicken thighs, tomato sauce, water, cheddar cheese, pickled jalapeños, and corn tortillas. Wow, that’s a mouthful. However, the ingredients come together pretty easily. First up was the prep consisting of trimming the chicken thighs of excess fat and cutting them into small pieces, and dicing the onion. Once this was done, I heated the oil in a 12-inch skillet over medium-high heat until it was hot and shimmering. When the oil was hot, I added the onion and cooked it until it was softened and began to brown. This took about 5 minutes. Next, I added the minced garlic, chili powder, coriander, cumin, salt and sugar, and cooked the mixture until it was fragrant. This took about 30 seconds. This was followed by the addition of the chicken, which I cooked until it was well coated with the spices. This took another 30 seconds or so. Finally, I added the tomato sauce and water. I stirred the mixture making sure that the chicken pieces were separated, and brought it to a simmer. I cooked it, uncovered, until the chicken was cooked and the flavors had melded. This took about 8 minutes. Once the chicken was cooked, I poured the mixture into a wire mesh strainer set over a bowl, and pressed the chicken and onions to extract as much sauce as possible. I allowed the chicken mixture to cool by transferring it to a bowl, and placing it in the freezer for about 10 minutes. Once the chicken mixture was cooled, I added the shredded cheddar cheese and diced jalapeños, and stirred to combine. For the assembly, I started by softening the corn tortillas in a 300° F oven for several minutes. Since it was just the two of us, I only rolled half of the enchiladas. I started by adding about ⅓ cup of the red chili sauce to the bottom of my baking dish. Then one-by-one, I placed ⅓ cup of the filling down the center of each tortilla, rolled it tightly, and placed it in the baking dish, seam side down. I poured another ⅓ cup of the red chili sauce over the top of the enchiladas, topped them with some more shredded cheddar cheese, covered the dish, and placed the enchiladas in a 400° F oven for about 25 minutes until they were bubbling and the cheese had melted. Talk about good. Generally, the Master Taste Tester does not like Mexican food, but he kept commenting on how good these enchiladas were. I totally agreed. I thought that they were outstanding, especially paired with the Mexican Rice and the Smashed Black Beans. Yum! Heat oil in medium saucepan over medium-high heat until hot and shimmering but not smoking, about 2 minutes; add onion and cook, stirring occasionally, until softened and beginning to brown, about 5 minutes. Add garlic, chili powder, coriander, cumin, salt, and sugar; cook, stirring constantly, until fragrant, about 30 seconds. Add chicken and cook, stirring constantly, until coated with spices, about 30 seconds. Add tomato sauce and 3/4 cup water; stir to separate chicken pieces. Bring to simmer, then reduce heat to medium-low; simmer uncovered, stirring occasionally, until chicken is cooked through and flavors have melded, about 8 minutes. Pour mixture through medium-mesh strainer into medium bowl, pressing on chicken and onions to extract as much sauce as possible; set sauce aside. Transfer chicken mixture to large plate; freeze for 10 minutes to cool, then combine with 2 cups of cheese and jalapenos in medium bowl and set aside. Adjust oven racks to upper and lower-middle positions and heat oven to 300° F.
Smear entire bottom of 13 by 9-inch baking dish with 3/4 cup chili sauce. Place tortillas on two baking sheets. Spray both sides lightly with cooking spray. Bake until tortillas are soft and pliable, about 4 minutes. Place warm tortillas on counter-top. Increase oven temperature to 400° F. Place ⅓ cup filling down center of each tortilla. Roll each tortilla tightly by hand and place in baking dish, side by side, seam-side down. Pour remaining chili sauce over top of enchiladas. Use back of spoon to spread sauce so it coats top of each tortilla. Sprinkle remaining 3/4 cup of cheddar cheese down the center of the enchiladas. Cover baking dish with foil. Bake enchiladas on lower-middle rack until heated through and cheese is melted, 20 to 25 minutes. Uncover and serve immediately, garnishing with sour cream, avocado, lettuce, lime wedges, etc. Yield: 4 to 5 servings.